The Santrallstanbul is an arts and cultural center in Istanbul, Turkey. It is one of Turkey’s most comprehensive cultural projects and was officially opened as part of the city’s Bilgi University in 2007. The structure consists of an energy museum, amphitheater, public library, concert halls and a modern art museum. 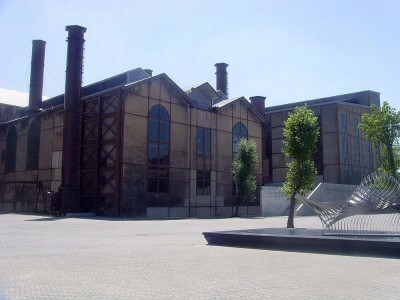 Santrallstanbul is situated by the Golden Horn in the Eyup district, at the former Silahtaraga power plant which was built during the Ottoman Empire. The power plant had served Istanbul for quite a long time, but was shut down in 1983. The Santrallstanbul is now a common tourist attraction in the city. The Silahtaraga Power Plant was converted to serve the public as a museum, information and education center. Its aim was also to create a space for art-production and exhibition. The Energy Museum comprises of the two former engine rooms of the Silahtaraga power plant. It is complete with its old turbines and elaborate consoles. The Gallery and Krek Theater of the Santrallstanbul serve as display and performance areas. These two areas have held more than 20 national and international exhibitions since the Santrallstanbul was opened in 2007. The storage and maintenance areas of the former power station serve as the dining and performance areas as well. The Santrallstanbul has been seen as a place of hope where creation and exchange of ideas prevail. As a monument to urban regeneration, it further elaborates on its theme of growth and renewal by being host to several educational workshops for young adults and children. Besides the contemporary arts museum which is situated at an old warehouse in the former power plant, the colossal complex houses fascinating modern art. The museum’s floor has two new buildings that were constructed later. The modern buildings are reinforced with steel and glass and are five stories high. These two modern buildings are connected with a glass-passage. Mobile dry walls inside the building separate the galleries. The walls are decorated in grey and brown colors.